Miami Florida Jet Ski Rentals available with Sun Life Water Sports Rental we offer variety of services such as Jet-Ski and Kayak’s our other services are available in Miami Dade county area. 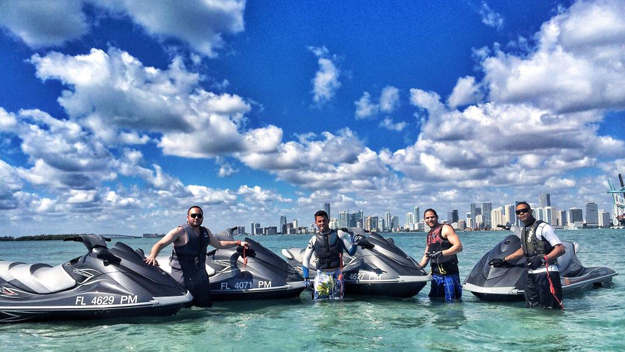 6 reasons to come have fun with us on a jet ski in South Florida. we’re fun come explore the oceans with Sun Life Water Sports in Miami and it’s areas. 6 miles of sightseeing adventure… homes of the rich and famous! Speedy jet-skis see manatees, dolphins. Compare that to the alternative a small circle ride zone with a view of condo’s lined up like domino;s.
Our jet ski’s have no speed restrictions, so they are still fast and fun! No deposit placed on your credit card, tying up for 4 days. Resort with free swimming pool, Tiki Bar next to waters edge with beautiful PWC ski’s and Yamaha Wave-runners cruising by your table. Free self parking save you $10-$15 by appointment! At our business our main goal is to make our costumers happy! We aim to make your vacation an amazing and adrenaline blasting fun while visiting South Florida. Believe us even if you never rented a jet ski or ridden one in your life these ski’s are made and designed to drive like a scooter just on the water. You got to see and explore the waters of beautiful Dade County, Florida that otherwise your regular tourists cant see or will never find but on a jet-ski. If you looking for some serious fun and even eat on a waterfront restaurants Miami-Beach you even find some hidden pirate ships to dine on that are not on your everyday tourist attraction books. So you believe living life its fullest and ready to scream You Only Live Once, then a Miami jet ski rental service is what you need to have an amazing time while visiting South Florida. Well then having a blast of your life off the shore of Surf-side on a jet-ski or perhaps luxurious yacht is the way to go and bring one of our jet-ski’s with you as your water toy to use one of the ships you would prefer to rent. We offer all options and possibilities to our costumers and can help you book your dream wave runner & Sea-Doo for rent in Aventura from our local friends. time of your life for your next event in South Beach and all other locations of the city we got your covered with anything personal watercraft as well with our partners. Enjoy the ocean waters even more and in luxury with a yacht charter tours in Miami with never before seen places around the Key Biscayne area on a yacht of your dreams.